Liposuction technology has evolved to the point that the long-established fat-removing procedure known simply as “liposuction” is now known as “traditional liposuction. Liposuction is a surgical procedure where fat is removed from underneath the patient’s skin by using a suction device known as a cannula. Liposuction is best for thin, average weight or slightly overweight patients who have found that fat remains in areas of their body no matter how much they diet or exercise. Patients who are moderately or extremely overweight may benefits from other techniques such as a tummy tuck. Dr. Smith and his team generally place traditional liposuction patients under general anesthesia, in which an IV administers the anesthesia and places you in a “sleeping” state. An experienced anesthesiologist will monitor you at all times when general anesthesia is given in Dr. Smith’s accredited surgery facility. Once the fluid has been pumped into the area of fat extraction, Dr. Smith inserts the cannula through the incision and, because the cannula is attached to an aspiration device, he is able to use suction to remove the fat from between your skin and muscle, contouring the area. You also should know that traditional liposuction probably will cause some swelling and bruising and you will feel minor to moderate pain and discomfort for a few days or weeks. Dr. Smith’s team will provide you with a compression garment that you will be instructed to wear for two to six weeks. For patients undergoing abdominal or hip/liposuction, it will look like a bicycle short and/or girdle. If you have your arms liposuctioned, it will look like long ladies’ opera gloves (without the hand/fingers part). You should wear it most of the time, removing it only for short periods or to wash it. Risks are always associated with any type of surgery. Liposuction procedures – of all types – are very safe and the vast majority of patients have no major adverse reactions, experiencing only the post-operative swelling/bruising and minor/moderate pain described above. Adverse reactions from the anesthesia. Scarred incisions, although the incisions are very small and any scars will be small and should fade over time. In addition, Dr. Smith will work to place his incisions in natural folds of your skin, helping to hide them. Bumpy/uneven results. These usually occur when your skin lacks enough elasticity to “shrink” tightly back onto your smaller frame. In addition, wearing the compression garment as directed helps keep the skin smooth. Loose skin can occur in patients who have a large amount of fat removed and/or don’t have much elasticity in the skin. 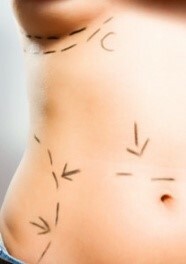 Contact Smith Plastic Surgery at (702) 838-2455 to discuss your desire for traditional liposuction. Patients who live far from Las Vegas may arrange a consultation via phone or e-mail.